Amazon’s Kindle Fire tablets are getting a major update, starting today, with the launch of Fire OS 3.1, an upgrade to Amazon’s mobile operating system, based on Android. The release introduces a host of new features including Goodreads integration, an AirPlay-like option for watching videos on your TV and improved enterprise support, as previously indicated. Earlier this year, Amazon had begun to integrate Goodreads into its tablet lineup following its acquisition of the social community for roughly $150 million. But in the latest Fire OS release (version 3.1), the social network has now been integrated directly into the reading experience, so you can participate in Goodreads without having to exit the book and launch an app. Readers can now capture and share their favorite quotes to Goodreads from inside the book, see what others are reading, and rate and review books upon completion. You’re also able to import all the books you’ve purchased on Amazon, including print and Kindle titles, into Goodreads, which is helpful for those who haven’t been keeping up with their Goodreads account over the years. Another major feature available in the forthcoming update is a “second screen” option, which lets you fling movies and TV shows from your Kindle Fire tablet to your TV. 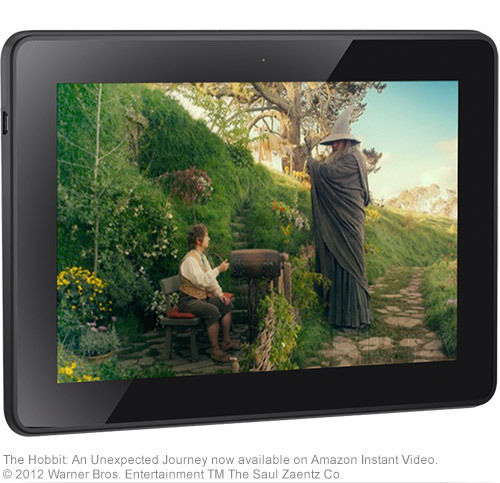 On the Kindle Fire HDX, you can then use the tablet for accessing playback controls, a custom display for X-Ray, or you can browse the web and check email while watching a movie, says Amazon. This option works in conjunction with the PlayStation 3 and Samsung TVs at present, but will be available later this year for the PlayStation 4. This addition also points to the need for Amazon to move into the TV space itself at some point with a competitor to Apple TV, so it can offer more of an end-to-end experience, instead of having to rely on third-party support. For enterprise tablet users, Fire OS 3.1 offers several new features, including the ability to securely connect to enterprise Wi-Fi networks to access corporate apps, documents and other resources on Microsoft SharePoint, and support for Kerberos authentication which enables secure intranet browsing from the Amazon Silk browser, as well as a native VPN client and native SCEP (Simple Certificate Exchange Protocol) client that lets users retrieve digital certificates for secure resources. Additionally, new Kindle-specific device management APIs are being made available, allowing existing MDM (mobile device management) systems to manage Kindle Fire tablets. The enterprise is going to be a tough nut for Amazon to crack, as today Apple’s iOS dominates this market. According to a recent report from Good, for example, iOS saw 90 percent of the total tablet activations in Q3 2013, and had 98 percent and 95 percent of total enterprise app activations in Q2 and Q3, respectively. The new OS release is being made available to the new generation of Kindle tablets, including Amazon’s $139 Kindle Fire HD, the 7″ Kindle Fire HDX, and the 8.9″ Kindle Fire HDX. The update will be delivered over-the-air in the weeks ahead, or you can download it directly from www.amazon.com/kindlesoftwareupdates today.